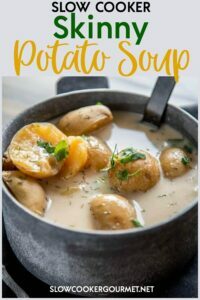 It is totally possible to indulge and eat lighter at the same time when you make this delicious Slow Cooker Skinny Potato Soup! It’s quick and simple to make and only tastes rich and creamy! Read my tips to lighten up your next comfort food meal! Who says eating lighter/healthier has to be boring? Of course we all like to indulge from time to time. Take this version of potato soup for instance. But you know what? This skinny version is just as delicious and you don’t even have to feel guilty about eating it! 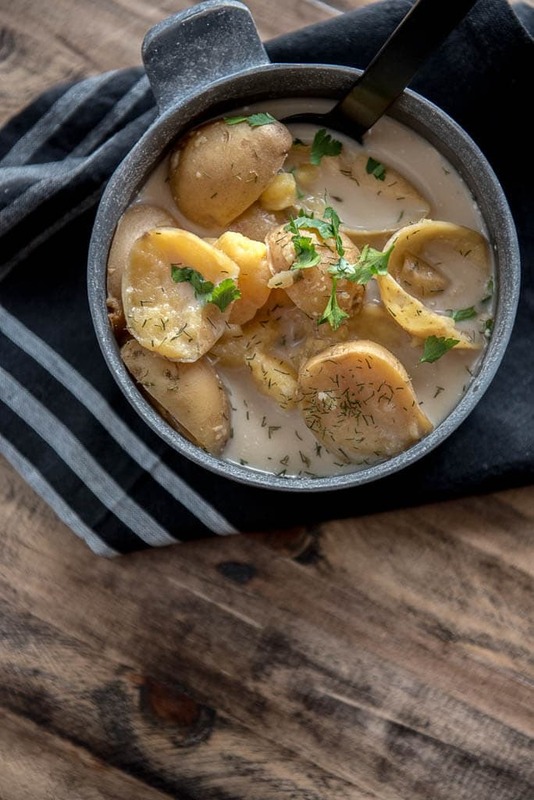 Huge tender chunks of potato in a super flavorful AND creamy broth make this a dinner I would love to eat any night of the week! Add Slow Cooker Skinny Potato Soup to your line up and have comfort food any night! Why make Slow Cooker Skinny Potato Soup? 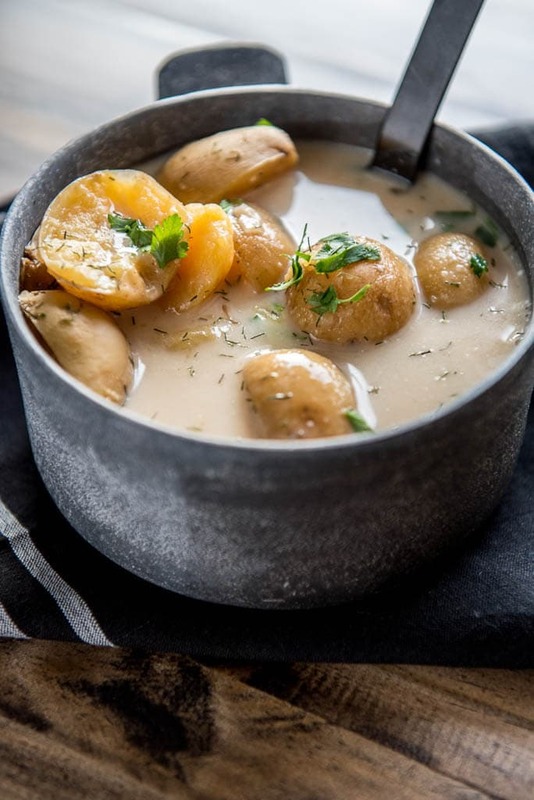 The key is finding some really creamy style potatoes like these delicious fingerling potatoes. Then a nice mix of herbs with onions and garlic in the broth cooking all day creates loads of flavor. Finally you add just a bit of whipped chive cream cheese to add the creaminess. The perfect potato soup! 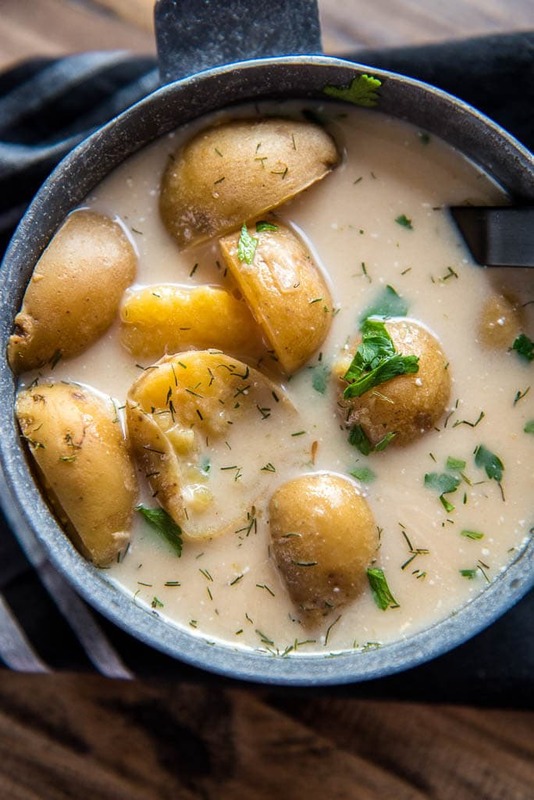 It is totally possible to indulge and eat lighter at the same time when you make this delicious Slow Cooker Skinny Potato Soup! It's quick and simple to make and only tastes rich and creamy! Read my tips to lighten up your next comfort food meal! I cooked this on high in my 3.5 quart slow cooker for 4 hours. You may have to give this a few extra whisks to fully incorporate cream cheese. It may look separated at first, but don't panic. Keep whisking and let heat through and it will become smooth. This soup is so comforting and delish! Love that it’s made in a crock pot! Oh my gosh! 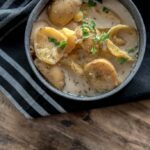 Yesterday I didn’t realize I was hungry until I saw this awesomely scrumptious potato soup recipe. I ran to the kitchen to replicate this fabulous goodness so I could have some for dinner. Let met tell you, it was just as delicious and comforting as the images within this post. For those who are thinking of trying this recipe – go make it!! !